Leaders, this is your source for info regarding Pack Meetings, Den Meetings, and being the best leader you can be. Below you’ll find links and documents intended to empower you with everything you’ll need to keep your den (and the Pack) informed and on the same page. You may want to start by reviewing the “Overview of Cub Scouting” page on the BSA website. Scroll through for some good info about how to make scouting fun, keep meetings organized, etc. It’s a healthy reminder for why scouting is fun and good for our boys. Den Meeting Plans is a great resource for leaders. This page includes general idea but also links to den meeting plans by rank. Click below to skip right to plans for your scout rank. Also included below are links related to the scouting handbooks. Click here to get a KINDLE VERSION of the Tiger Handbook. Click here to get a KINDLE VERSION of the Wolf Handbook. Click here to get a KINDLE VERSION of the Bear Handbook. 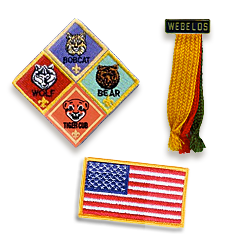 Click here to get a KINDLE VERSION of the Webelos Handbook. There are also Helpful Hints for Den Leaders available here. Pack Meeting Plans are available online. Scroll down on that page to the 2015-16 Pack Meeting Plans and you can reference theme-related plans for that month, including pre-meeting gathering ideas, ideas for the meeting Opening, songs, skits, etc. When your den is scheduled to handle part of the Pack Meeting, this resource can be extremely valuable. Please reference these PDFs for the Opening Flag Ceremony and the Closing Flag Ceremony. Dens with setup duties please arrive at 6pm to setup and greet arrivals. 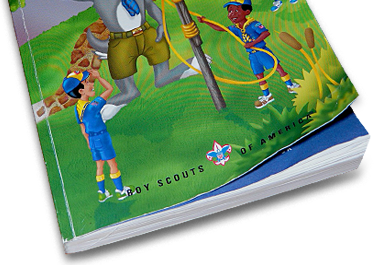 The Roundtable Cub Scout Planning Guide can be an excellent resource for planning den meetings that are keeping with the theme of a given month. Click below to view the printable PDF (or right-click to download). Yahara District Roundtables are held the first Wednesday of the month (except in July and August), at the Church of Jesus Christ of Latter-day Saints, 5602 Irongate Drive, Madison, with the “Commissioner’s meeting” at 6:30 followed by Roundtable announcements at 7pm and breakout sessions following. All leaders must complete the YOUTH PROTECTION TRAINING with the BSA. To complete your training, please visit myscouting.com and create a new account, or login if you already have an account. You can learn more about Youth Protection Training here. All leaders should also take part in LEADER SPECIFIC TRAINING. Please reference this Glacier’s Edge Council Training Schedule [PDF]. The BSA site offers an important Guide to Safe Scouting on their website. Here you’ll find safety tips for youth protection, aquatics, camping, and health & first aid, as well as alcohol, tobacco, and drugs policy information. You can review on online copy of all topics here, or download the PDF version of the safety guide. As a leader you may find it helpful to reference the Glacier Edge Council website from time to time. There are resources involving camps, activities, and events on the Council calendar.